STORY: Less than a year later reports of a newly discovered commander Gear surfaced. Fearing the dawn of another war, the United Nations held a tournament, offering 500,000 World Dollars for the destruction of the Gear. The Gear was a girl named Dizzy, who, while very powerful, lacked a desire for war and unnecessary destruction. 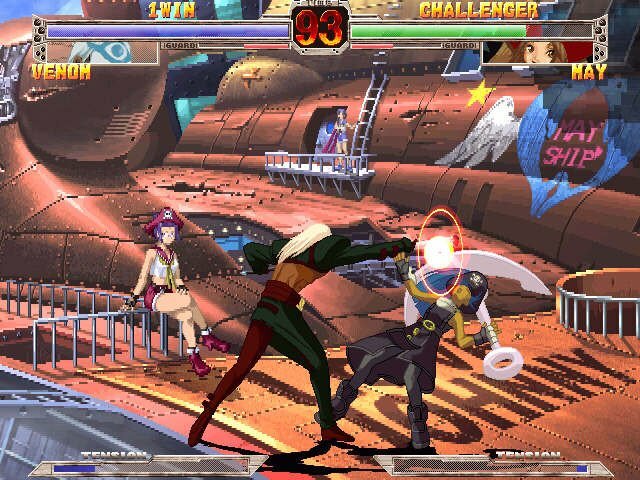 She was defeated but her life spared by Sol Badguy. 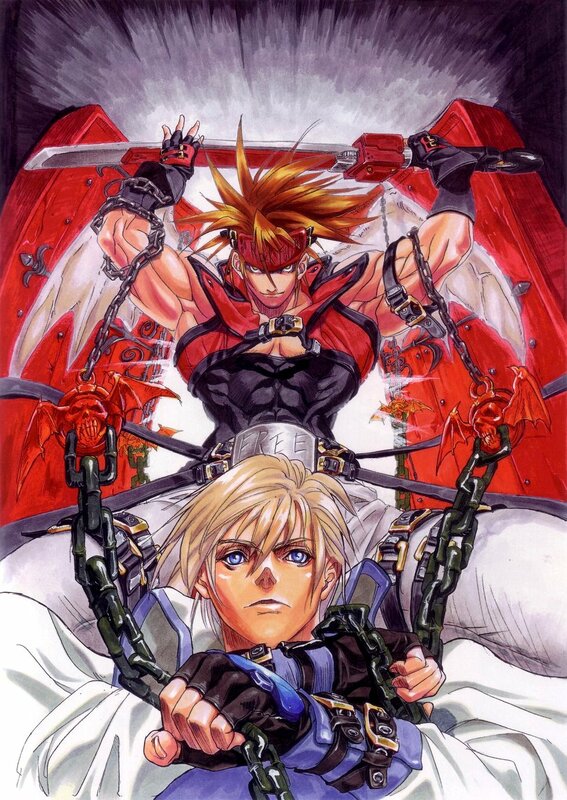 Soon, though, she was found by Ky Kiske, the charismatic police chief of the United Nations and ex-chief of the Sacred Order of Holy Knights. He entrusted her care to Johnny, leader of the Jellyfish air pirates, who welcomed her as one of their own. 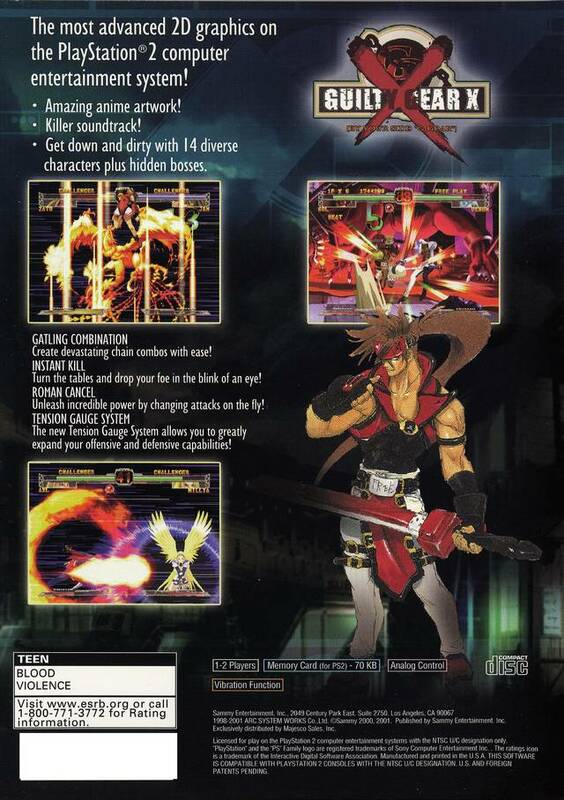 Jam Kuradoberi, a bounty hunter and struggling chef, claimed credit for Dizzy's disappearance so she could collect the reward and finance her restaurant. Enter a new age of 2D sprites. 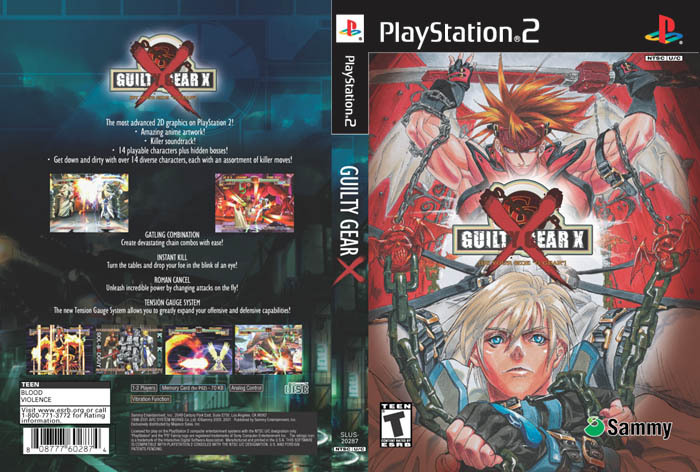 REVIEW: Guilty Gear X isn't simply a sequel, it's an entirely new game compared to its PS1 predecessor. 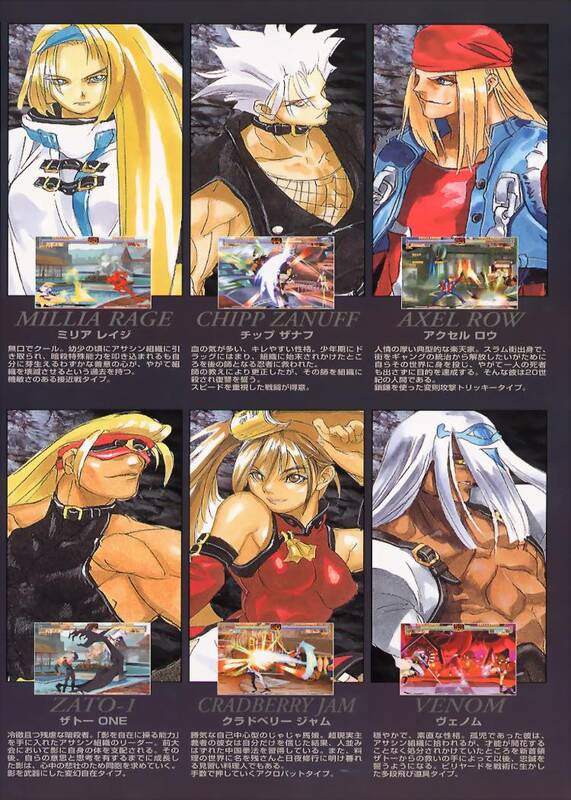 Presenting some of the largest and most impressive 2D sprites ever seen in a fighting game (or video game for that matter), GGX certainly makes quite a statement as a 2D fighter in the year 2000. GGX's presentation is complete with a badass anime intro, a wild metal-driven soundtrack, top notch voice acting, and stylized high-res graphics from start to finish. 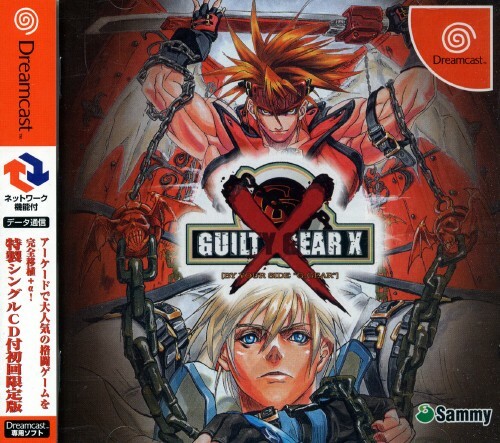 GGX was surely one of the best looking fighting games of the time, and also a very original fighter in terms of how its played. 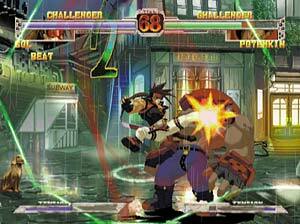 It's always fun fighting the behemoth Potemkin. 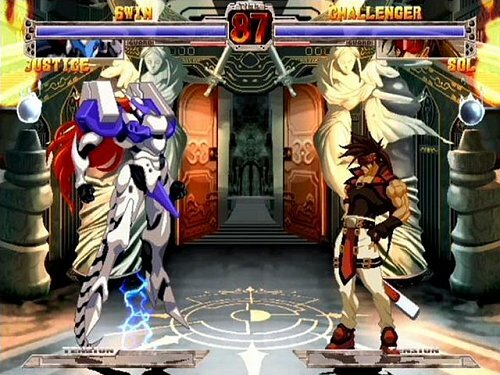 Guilty Gear X definitely isn't your typical 2D fighting game.... 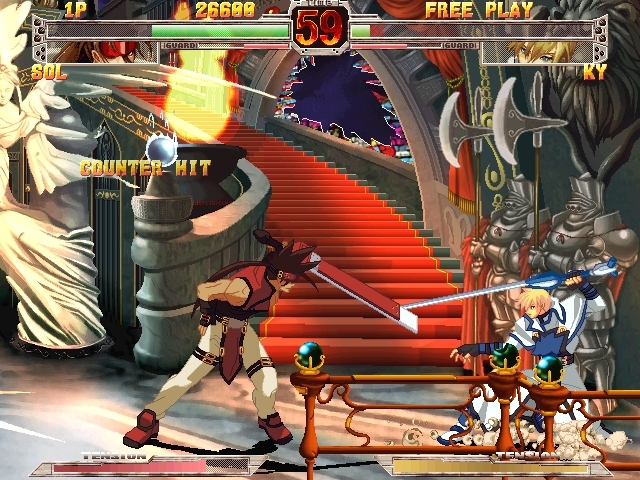 The characters and gameplay can be described as "unorthodox" or "off-the-wall," which is clearly the inspiration behind Arc System Works design direction. 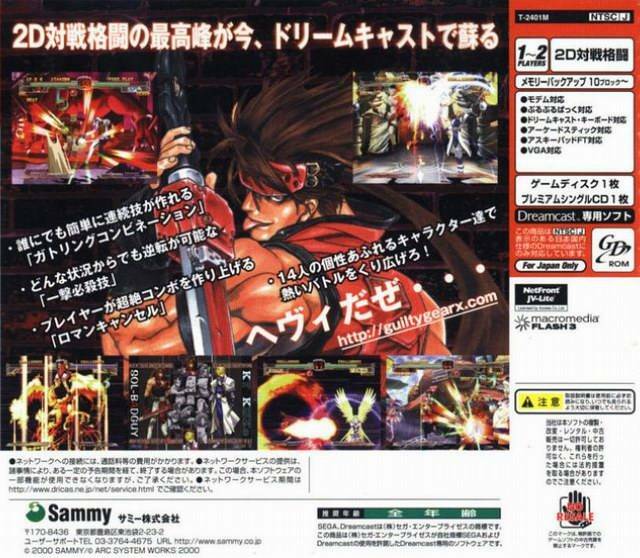 This unusual, and "extreme" take on the traditional fighting game engine really allows Guilty Gear to stand out from the crowd. 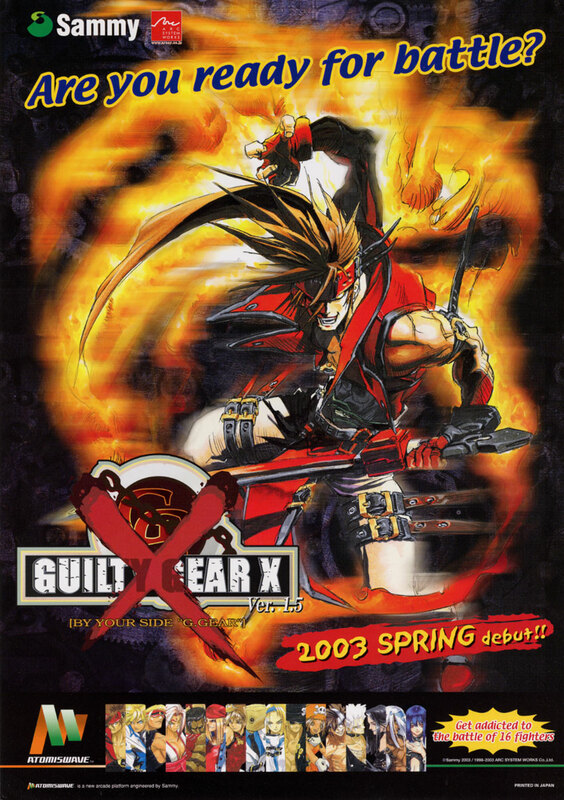 Although Guilty Gear X borrows the obvious framework from Capcom's and SNK's iconic 2D fighters, the control scheme and style of gameplay is almost completely different than your traditional 2D fighter. 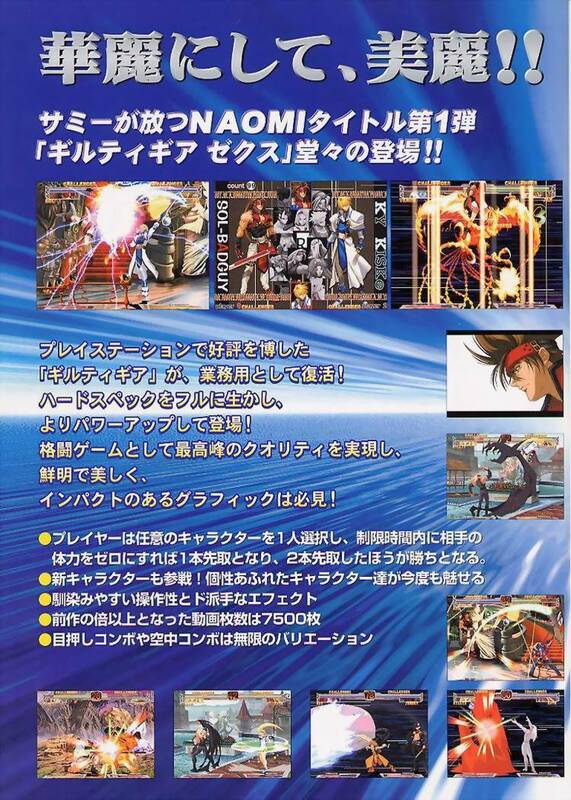 The dynamic and fast-paced gameplay system features Air Dashing, Overdrive Attacks, Instant Kills, Faultless Defense, Roman Cancels, and Dead Angle Attacks. I could go and explain every one of those gameplay elements, but that would take more paragraphs than I'm willing to write. 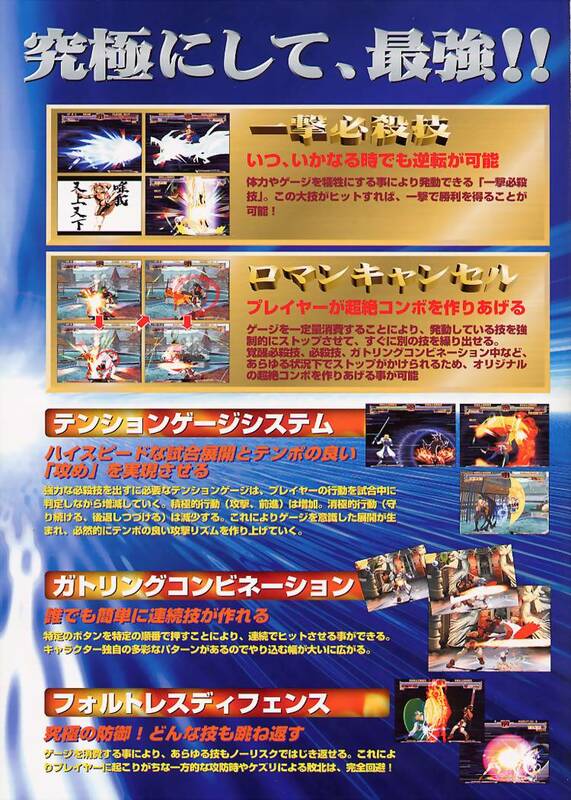 To sum it up, each characters super meter or "Tension" gauge can be used for several different techniques, but is usually saved to unleash those devastating super moves or overdrive combos. 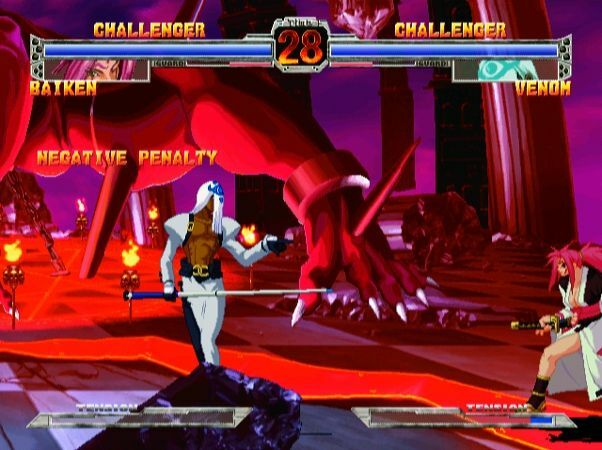 The instant kill moves are quite entertaining if you can manage to pull them off, although they can cause a bit of unbalance in high level play. If I could nitpick anything, I'd say the "2-button sweep" is a bit annoying and unnecessary. 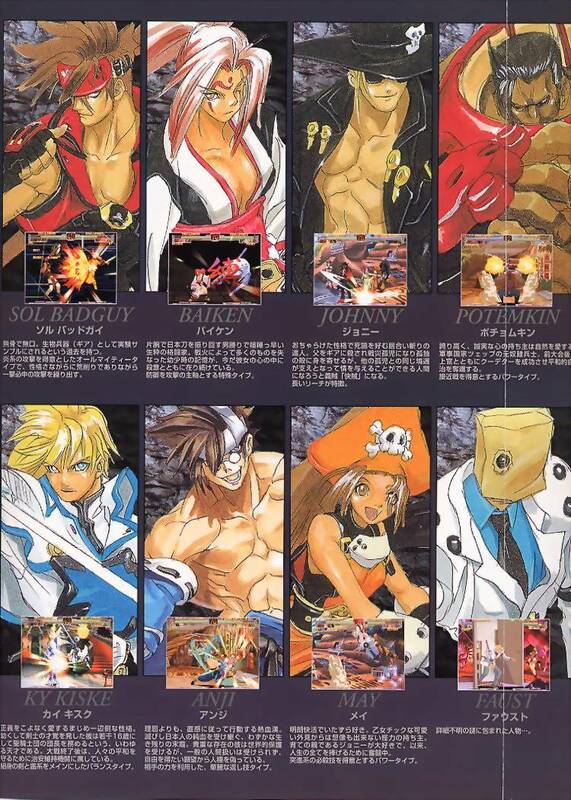 Once again, Guilty Gear X's visuals made a pretty big impact when the game first arrived in arcades (and on consoles, especially). The animation can be described as "anime style"... in other words, frame counts are kept low, but seem to animate best where it counts. 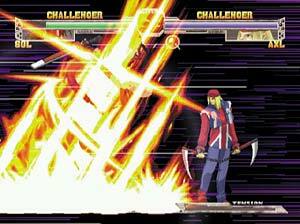 However, some of the characters could move a bit more fluidly, especially when compared with "the best" 2D fighting game animation out there. 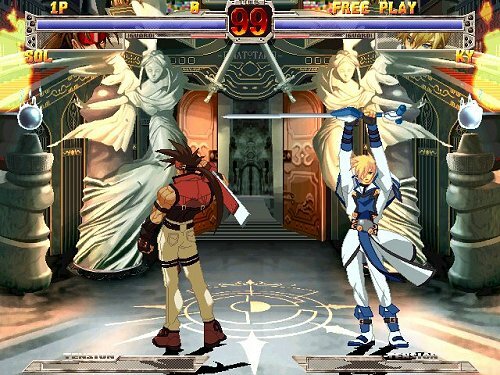 For instance, the animation of Guilty Gear X doesn't come close to the fluidity of the Street Fighter III series... (a somewhat understandable compromise for the larger sprites I suppose). 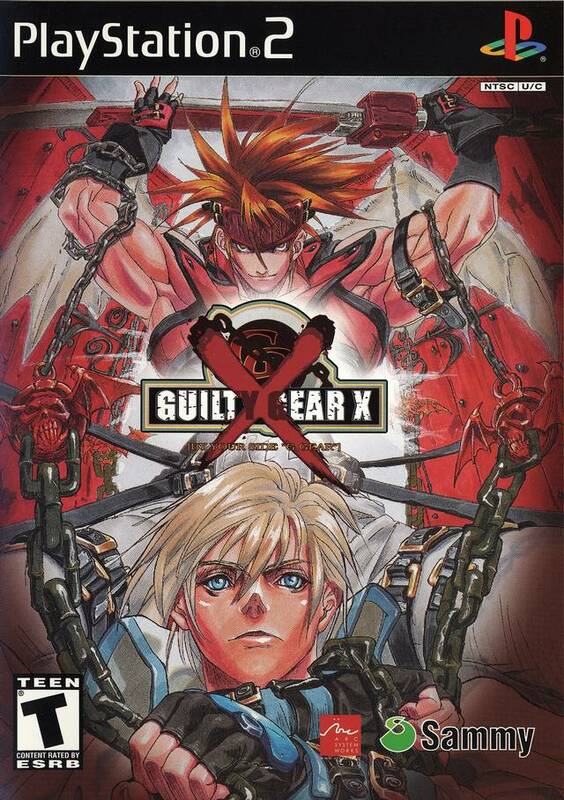 Still, GGX's animation does a lot of justice to the character designs and overall visuals of the game. 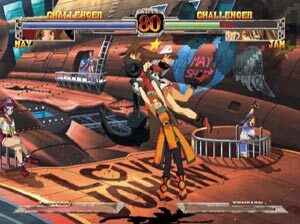 The colorful, diverse and dynamic fighters of Guilty Gear duel in some of the flashiest and most intense battles you'll see in any fighting game. 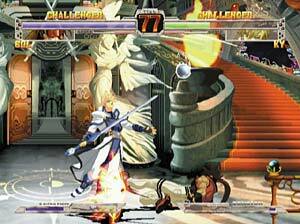 While most of the "staple" nuances you'd expect from a 2D fighting game are present, Guilty Gear X managed to introduce elements that no other 2D fighters had at the time. 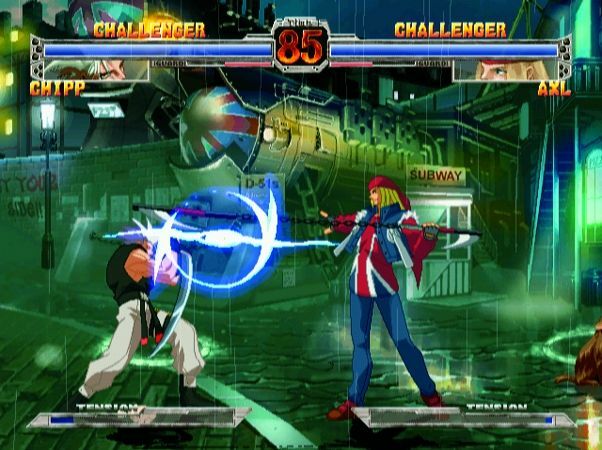 Due to its originality and unorthodox character designs, GGX undoubtedly caught the attention of many casual and even "non" 2D fighting game fans, while offering a brand new flavor to seasoned players. 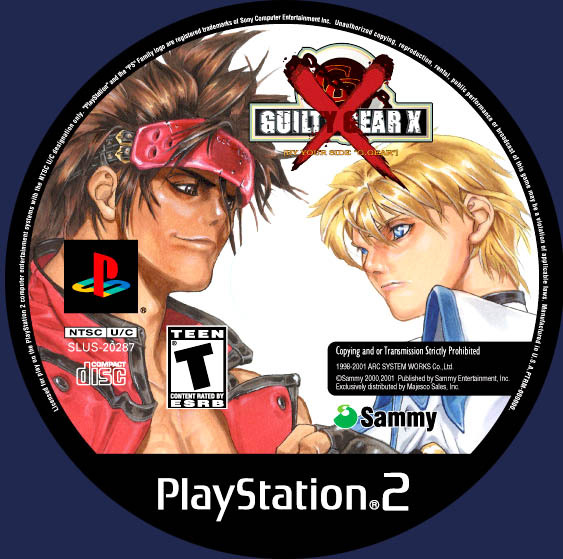 I remember initially being very impressed with GGX when I first got my hands on it... but for me, the game just didn't have the lasting appeal that other (more traditional) 2D fighting games had at the time. 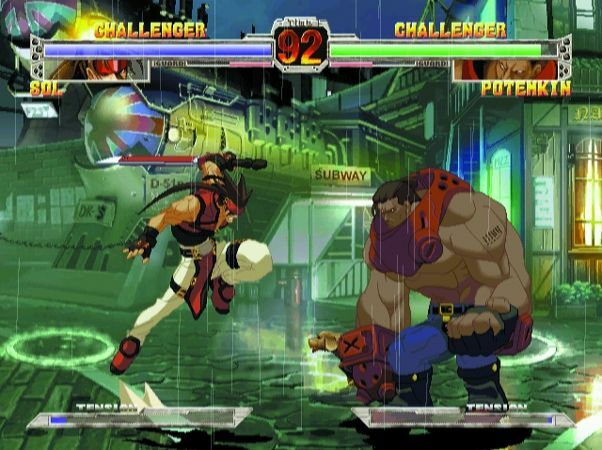 I could tell GGX had bark and bite however... boasting a fighting system that's easy to pick up and play but very difficult to master - like any good fighting game.